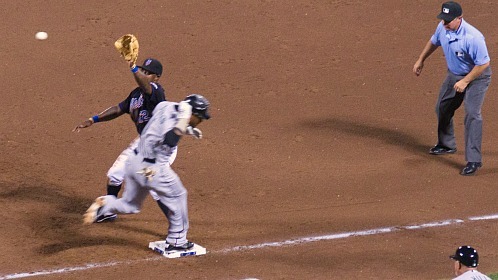 Home » Mets Photos » Bonifacio: Safe or Out? Hmm … if I’m Bonifacio, I want a “do over”. Well done, Gary! Out by a mile! That is Harris flipping the ball back to the pitcher. The quality of Major League umpires has really gone down the tubes. Hi all. I have been a loyal, daily reader for over a year now, and this is my first time commenting. Joe, you do a great job, and I look forward to reading your insights on the game I love. It certainly seems that umpires today miss many more calls then they used to. How much of this is due to new technology, such as the “freeze cam,” many new viewing angles, and archiving of footage broadcasted all over TV, the internet, etc,? I feel that umps have always missed calls, but now we just catch them. It is impossible to get away with a missed call nowadays, no matter how large or small, since it has been recorded, is picked apart by ESPN, individual sports networks and fans on the internet. As a Met fan, I hate to say this, I’m glad Bonifaco got a hit next AB because I dont want to see his streak ends by a bad call by umpire like Joyce did to Galarraga’s perfect game.